PRESIDENT Mugabe yesterday said Government will exercise zero tolerance to corruption and urged the law to take its course on former Zimbabwe Mining Development Corporation board chairman Mr Godwills Masimirembwa for allegedly demanding and receiving a US$6 million bribe from a Ghanaian firm that sought to invest in diamond mining at the Chiadzwa Diamond Fields in Marange. Mr Masimirembwa resigned from the ZMDC board ahead of the July 31 harmonised elections to contest the Mabvuku/Tafara National Assembly seat which he narrowly lost to Mr James Maridadi of MDC-T. The wrath of the law, President Mugabe said, must take its unimpeded course in the matter as such rot cannot be tolerated under his watch. 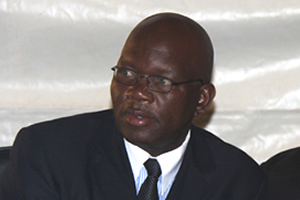 The Head of State and Government and Commander-in-Chief of the Zimbabwe Defence Forces said Masimirembwa and his group demanded money in cash and created a shelf company that took equity in the diamond mining firm under unclear legal circumstances before astonishingly claiming that the Ghanaians had violated some unspecified Zimbabwean law and threatening them with arrest should they set foot in Zimbabwe. President Mugabe was addressing guests who included Government ministers, Members of Parliament, traditional leaders and senior Government officials at a luncheon hosted by the Ministry of Local Government, Public Works and National Housing to mark the official opening of the First Session of the Eighth Parliament of Zimbabwe yesterday. “Corruption must go, corruption must go, corruption must go,” he said. “Vakanzi unzai mari, US$6 million first through the normal way, imwe iyi chiunzai, kwete through bank transfer, youya iri cash makaibata. Nevanhu vedu managing our own banks and managing our own mining sector. President Mugabe said when the Ghanaian firm’s officials wanted to bring their equipment into Zimbabwe, they were told not to come back on the pretext that they would be arrested. He said the Ghanaian firm had entered into a joint venture with ZMDC where it had 30 percent stake. But its officials remained outside the country dreading the spectre of arrest threatened by the former ZMDC boss despite assurances given to the Ghanaian firm by Commissioner-General of Police Augustine Chihuri that they would not be arrested as they had not violated any law. This was after Masimirembwa continued telling the Ghanaians that the risk of arrest remained. President Mugabe said efforts by the Ghanaians to approach former South African president Thabo Mbeki for help through that country’s central bank did not help matters as Mr Masimirembwa continued warning that the police wanted to arrest them. “Even after being given assurance by the Commissioner-General of Police kuti huyai, ivo vakati no, hatikwanisi kuuya tichisungwa. TineBank kuno kuGhana, tikasungwa chete, there will be a run on the bank,” the President said. The Ghanaians, President Mugabe said, ended up flying all the way to Washington to meet the then Mines and Mining Development Minister Obert Mpofu (now the Minister of Transport and Infrastructural Development) who was attending a diamond mining meeting in the US. “He (the Ghanaian investor) flew to Washington, Minister anga ana (Johannes) Tomana, Attorney-General naMasimirembwa, zvonzi ‘mhosva chii?’, Minister says ‘I don’t know about this’, then Masimirembwa says, ‘ehe kune mhosva’. ‘Yei?’, ‘A-a tichataurirana’, ah-ah vabva vatadza kuuya,” the President said. “Minister says tichadzoka, vodzoka, vobvunza kunaCommissioner (General of Police) kuti ‘are there any cases?’, Commissioner says, ‘Hakuna mhosva, ngavauye, I am giving them assurance’. He is given assurance, asi achiri kutya kuuya, ndokuzonzi chimhara kuBulawayo we will take you from there. “Ndokutora Minister apa, Commissioner apa, VaMasimirembwa nechigroup chavo apa, vochinzi chitaurai imi mapurisa, munedocket here rekusunga uyu? Vakati aiwa hatina isu. Ko VaMasimirembwa, zvamaitaura, uyu ane mhosva yei? Tonho! Tiudzei zve? Tonho! Ha-a come on, we can’t have that in our country. That naked corruption, no!” the President said punching the lectern for emphasis. A senior police officer who did not want to be named as he is not authorised to speak for the ZRP confirmed last night that the matter was under investigation and told The Herald that Masimirembwa allegedly worked in cahoots with two prominent local businesspeople in creating a shelf company through which the illegal proceeds of the money fleeced from the Ghanaian investor were channelled. “Preliminary investigations showed Masimirembwa got around US$4 million cash and was working with two prominent businesspersons (names supplied),” said the police official. Officially opening the First Session of the Eighth Parliament, President Mugabe said structures to combat corruption shall be bolstered through the establishment of the National Prosecution Authority as prescribed in the new Constitution. The NPA will take over functions previously performed by the Criminal Division of the Attorney-General’s Office. The composition of the Zimbabwe Anti-Corruption Commission, whose Commissioners will be required to adhere to a strict code of ethics and to publicly declare their personal assets, will also be aligned to the new Constitution. Efforts to get comments from Mr Masimirembwa last night were fruitless as his cellphone was continuously unreachable.